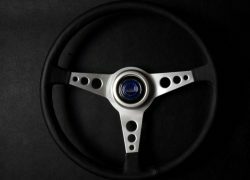 Item description: Jensen leather steering wheel to fit later Jensen FF MK.I (119/101 through to 119/195), and later Interceptor MK.I. 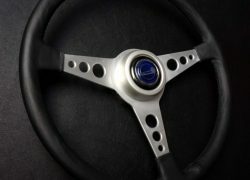 The steering wheel will also fit Jensen FF & Interceptor Mk.II cars. Condition report: Fully refurbished. Process of refurbishment includes taking out all minor scatches from the aluminium, polishing, and then refinishing with satin silver finish. The black leather is replaced and sewn as per the original. 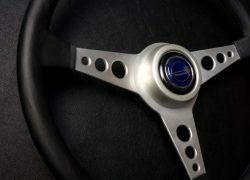 The finished steering wheel is breath taking. Special notes: We only accept a part-exchange system on this steering wheel. Your steering wheel must be free from any major damage or deep scratches to the aluminium work. The horn push and surround is not included.